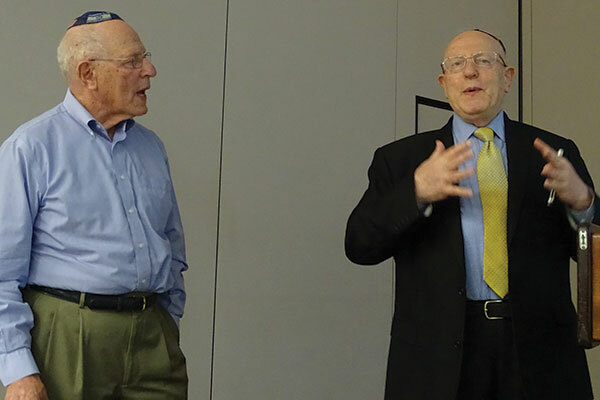 Bernard, left, and Henry Schanzer tell their story of survival at a Lunch & Learn session at the Holocaust Council of Greater MetroWest. They told their tale, sometimes with humor, at a Lunch & Learn meeting of the Holocaust Council of Greater MetroWest. The identical twins, born in Belgium, said they lived because of the kindness of Christians who protected them from Nazi genocide. “We owe our survival to the actions of righteous gentiles,” said Bernard. Among them was Jeanne Bonhomme, an acquaintance of their mother, and Bonhomme’s mother, Adolphine Dorel. Henry and Bernard nicknamed the older woman “La Memee,” their honorary grandmother. Their presentation on Jan. 25 came two days before the United Nations observed its annual International Day of Commemoration in memory of the victims of the Holocaust. 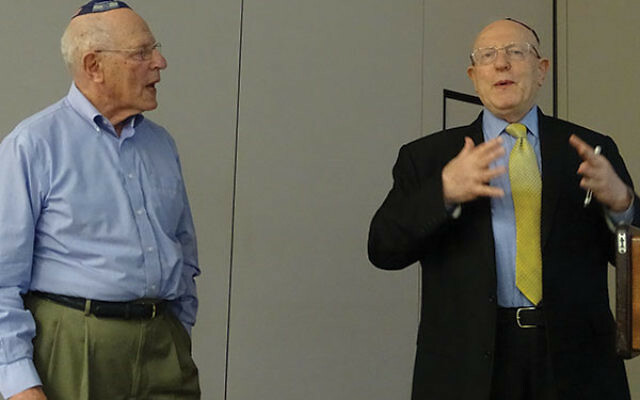 Speaking at the Aidekman Family Jewish Community Campus in Whippany, Bernard and Henry Schanzer expressed gratitude to the non-Jews who risked their own lives to keep the boys, their mother, and their sister alive amidst the death around them. Bernard lives in West Orange and Henry is a resident of Edison. With a copy of their parents’ marriage license on the screen, Henry said, “We display this to you to prove our legitimacy.” It was the first of many jokes the brothers would use humor to offset their tale of childhood horrors. A few days after German troops invaded Belgium on May 12, 1940, 15 members of the Schanzer’s extended family fled to France, moving from town to town until they settled in the village of St. Etienne. On their way they survived an air attack by the Nazis as they watched cars, buildings, and people “blown up into the air,” Henry said. At first, they managed to maintain a happy family life in Vichy, France, said Bernard, who showed a portrait of the Schanzers on vacation in the summer of 1941. Bernard recalled that before he and his brother were put on a bus heading toward refuge in a Christian home, their father held them on his knees “and all of a sudden everything started shaking. Our father was sobbing. I had never seen him cry.” After the two boys boarded the bus, “We were never to see him again,” said Bernard. Shortly thereafter, Bruno was arrested by the Nazis, sent to a French detention camp, and ultimately perished in Auschwitz. When their mother was arrested by a French police officer “there was an appropriate exchange of money,” said Bernard. “My mother knew the power of the purse.” Ultimately she managed to obtain false papers saying that she was not Jewish, and she went to work at a castle owned by Count Xavier and Countess Marie-Francoise de Virieu, who were with the French resistance. They were each given a set of rosary beads. “I don’t know where Bernie and I got the courage to rebel, but when everybody got down on two knees we cheat and only kneel on one at a time,” said Henry. Later, when the boys were sheltered on a farm owned by the woman they called La Memee, they posed as Protestants to conceal their Jewish identities, but at night they would quietly recite the Shma. After La Memee questioned their mumbling, they explained the sacredness of the Jewish prayer and she asked to learn it so that she could pray alongside them. After the war they reunited with their sister and mother, and traveled to New York in 1946. They were provided temporary shelter by the Hebrew Immigrant Aid Society before moving to a fourth-floor walkup in a Lower East Side tenement. Bernard praised his mother for being a great woman. The day of the presentation was, coincidentally, the 52nd anniversary of her death in 1965. “We all know that Jewish women have maintained the religion and the family,” he said. They struggled to learn English, but accomplished that feat well enough to graduate from high school and City College before Bernard went to medical school and Henry studied law. Their late sister, Anna, became a French teacher; she died in Israel where she moved in 1980. That same year she successfully petitioned Yad Vashem to award Bonhomme and her mother the honor of being named Righteous Among the Nations. Last summer, Bernard, Henry, and three generations of family members returned to France for another ceremony — this one at the castle honoring the marquis and his wife as righteous rescuers. The brothers and their relatives walked to La Memee’s farmhouse, where they were saluted by local residents and a plaque was unveiled near the farmhouse in her honor. “When you hear deniers of the Holocaust and when you hear anti-Semitism you have to speak loud and clear and try to emulate the righteous among the nations,” said Barnard.